A Gantt chart is a horizontal bar chart developed as a production control tool in 1917 by Henry L. Gantt, an American engineer and social scientist. Frequently used in project management, a Gantt chart provides a graphical illustration of a schedule that helps to plan, coordinate, and track specific tasks in a project. Gantt charts may be simple versions created on graph paper or more complex automated versions created using project management applications such as Microsoft Project or Excel. 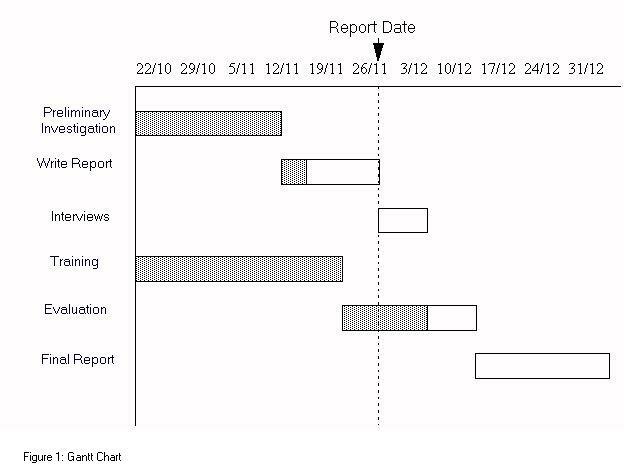 A Gantt chart is constructed with a horizontal axis representing the total time span of the project, broken down into increments (for example, days, weeks, or months) and a vertical axis representing the tasks that make up the project (for example, if the project is outfitting your computer with new software, the major tasks involved might be: conduct research, choose software, install software). Horizontal bars of varying lengths represent the sequences, timing, and time span for each task. Using the same example, you would put "conduct research" at the top of the verticle axis and draw a bar on the graph that represents the amount of time you expect to spend on the research, and then enter the other tasks below the first one and representative bars at the points in time when you expect to undertake them. The bar spans may overlap, as, for example, you may conduct research and choose software during the same time span. As the project progresses, secondary bars, arrowheads, or darkened bars may be added to indicate completed tasks, or the portions of tasks that have been completed. A vertical line is used to represent the report date. Gantt charts give a clear illustration of project status, but one problem with them is that they don't indicate task dependencies - you cannot tell how one task falling behind schedule affects other tasks. The PERT chart, another popular project management charting method, is designed to do this. Automated Gantt charts store more information about tasks, such as the individuals assigned to specific tasks, and notes about the procedures. They also offer the benefit of being easy to change, which is helpful. Charts may be adjusted frequently to reflect the actual status of project tasks as, almost inevitably, they diverge from the original plan. Create your own Gantt chart online or download a copy of the software. Tulane University provides a guide to the use of charting methods for project management in PERT, CPM, and Gantt charts. Provides a graphical illustration of a schedule. Gantt charts help set milestones for projects.